Your teeth are made up of two main sections—your root and your crown—and both are integral to your oral health. When you lose a tooth and its roots, you can encounter issues beyond simply an unattractive hole in your smile such as infection and bone atrophy. Dental implants offer an ideal way to replace lost teeth or to secure loose-fitting dentures because they address both sections of your tooth. 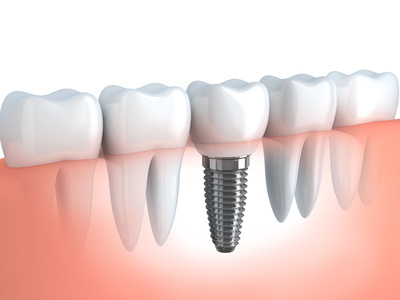 Unlike bridges or removable dentures that sit on top of your gums and only address the crown portion of your tooth, dental implants replace both the crown and the root of your missing tooth. 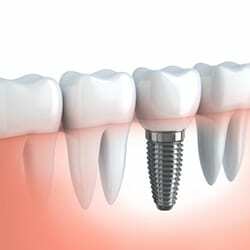 Dental implants consist of a sterile titanium “root” section that acts as an anchor for your crown. By replacing both the root and the crown of your tooth, dental implants act just like a natural tooth, maintain good oral health, and allow you to speak, chew, and smile normally.